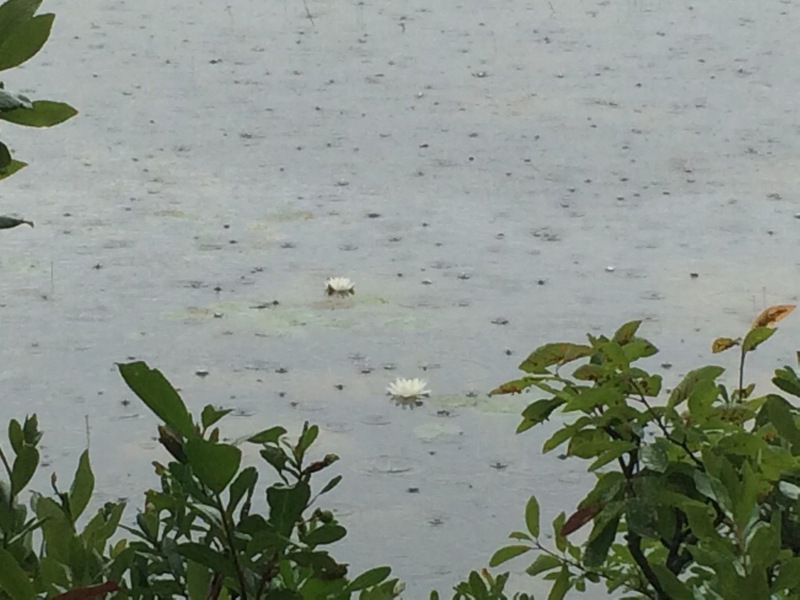 AT Lodge, Millinocket, ME, AT NOBO mile 2,180.1, Monday August 4, 2014 — Up to this point, every day, every mile, every rock, every root, every mud hole has been a preliminary heat. Now we’ve made the finals. With toes on the starting line, the assent of Mt. 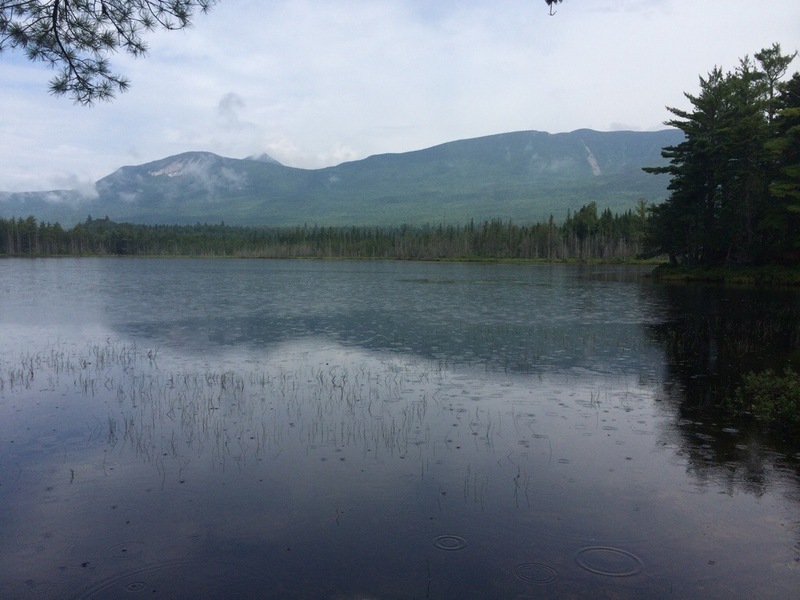 Katahdin has been delayed by a 70 percent chance of thunderstorms tomorrow. A similar percentage applies for Wednesday. 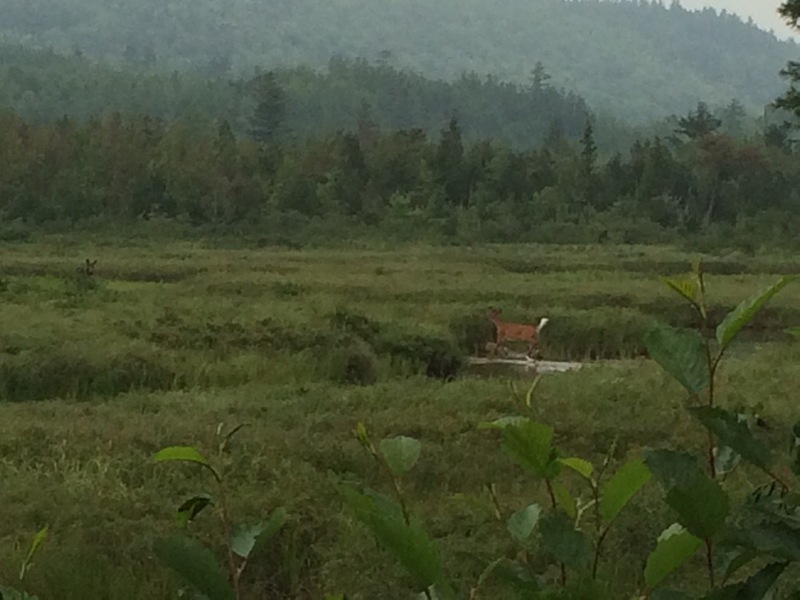 I opted to regroup at the AT Lodge in Millinocket and climb on Thursday when the weather is expected to clear. It’s sad to come this far and not get a clear view on top, so I’m waiting. 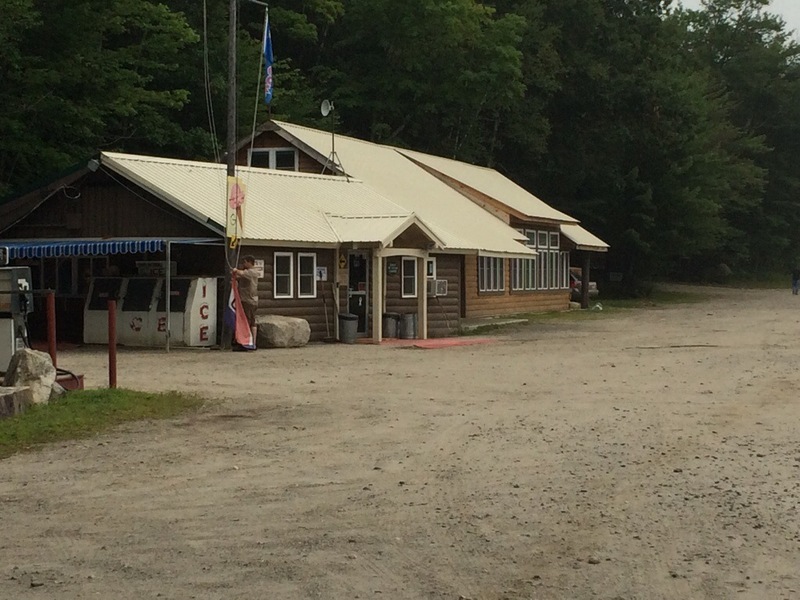 I reached the camp store at Abol Bridge just as it opened. Hot, fresh coffee! Oh boy. Then it happened. 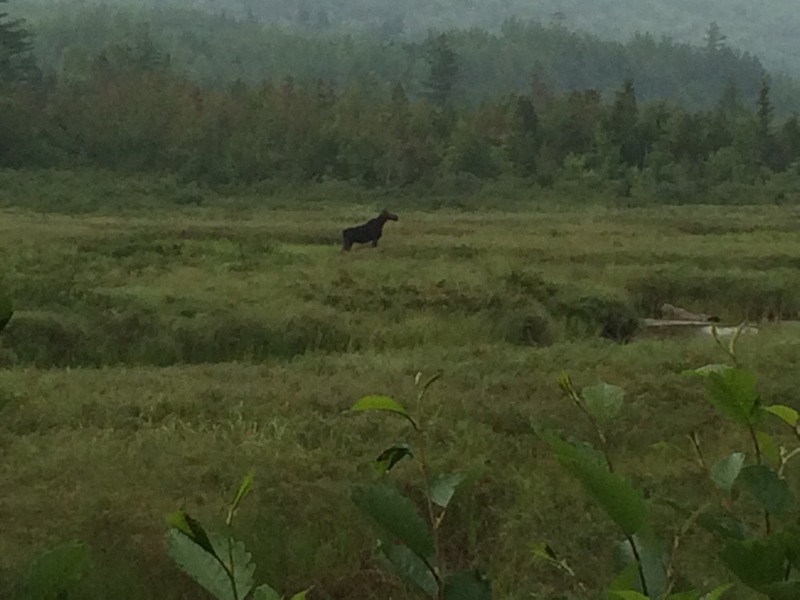 There it was – a moose just inside Baxter State Park! 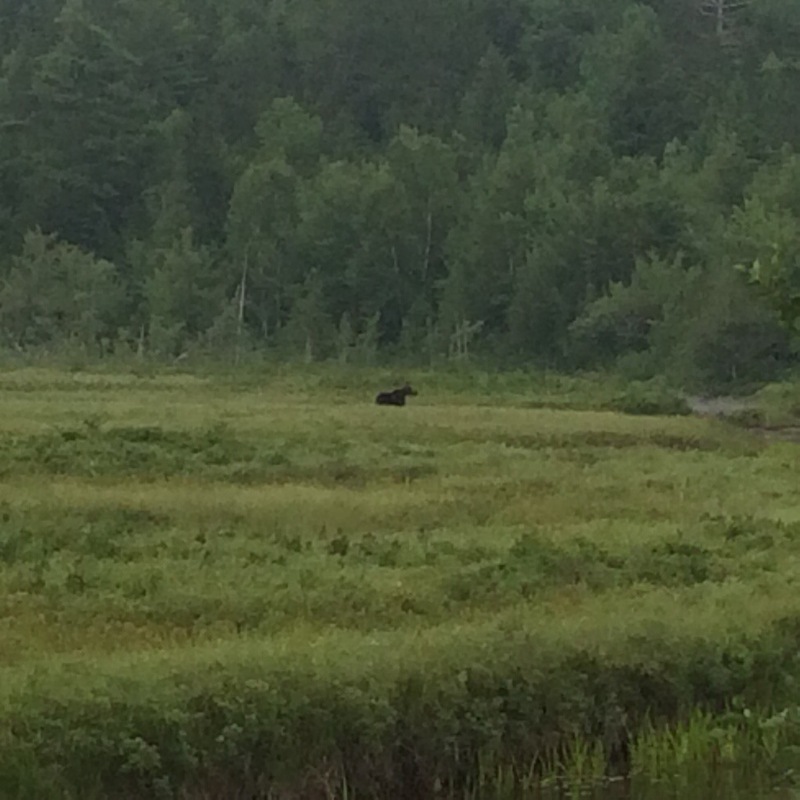 It was munching its way through a swamp to my right. Rain or no rain, I whipped out my camera and fired away. Mr. Moose, or maybe it was Bullwinkle, posed like a pro. Thanks bro!!! The store and it’s setting reminded me of Alaska. The white tail was a bonus. ← Eyes on the prize! Oh I’m so excited for you!! Thanks for the awesome pics along the way. Can’t wait for the victory pose pic atop the sign. Seems so long ago we sat on the rock pointing at the first AT blaze in a freezing wind! Mayday, I kept you in my thoughts all along the way. Wish you were here to share the moment. It’s hard to believe it’s been 5 million steps since that frigid morning when Hiker Dave deposited us at the Springer parking lot. Thanks for your unwavering support all along the way. 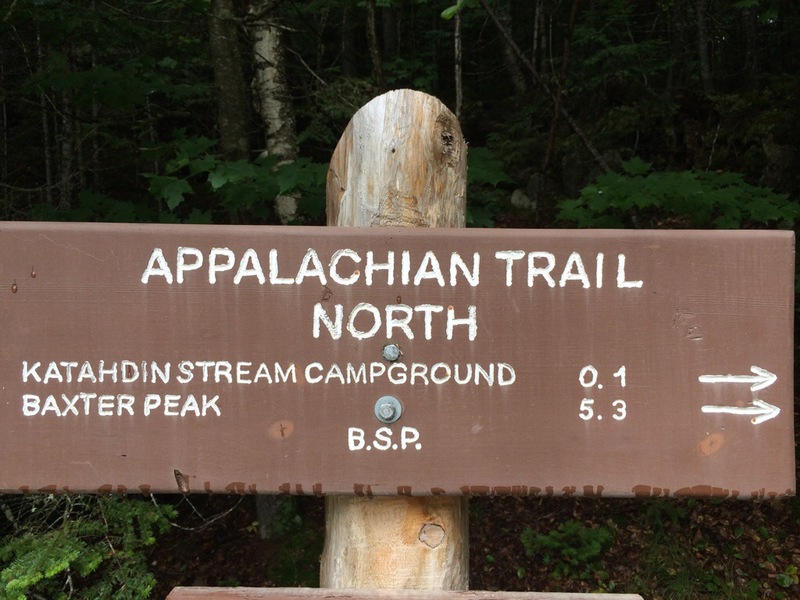 Oh, I’m “man down” now….earned that trail name just outside of Erwin…. You’ll always be “up” in my book. Jim: I am going to miss this!!!! Do you think you could go south now??? I have a card on my desk I just got; it says: Make Yourself Proud. YOU certainly have, and there are so many of us who are proud of you as well. You go Jim!!! 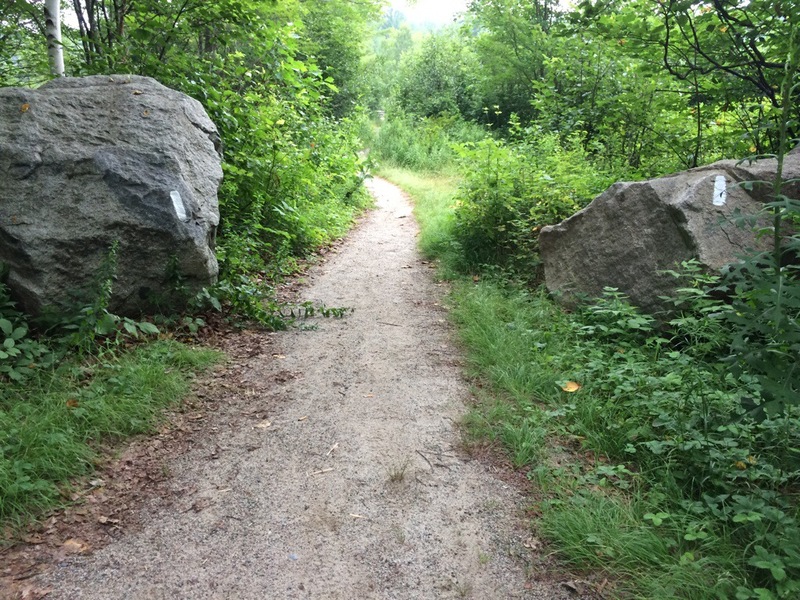 Reversing direction after completing a thru hike is called a yo yo. In slang, yo yo also has a less than positive connotation. To paraphrase Richard Nixon, “I am not a yo yo.” I will miss writing a daily blog. Perhaps I can find a new excuse to write. I’ll certainly try. Jim – I’ve really enjoyed this exciting adventure through your blogs. Can’t wait for the book and the movie. This has been quite the journey for you ! Your past few posts just came through so I’m sitting here at work catching up. I’m SO excited for you to start your final push! I can’t imagine how you must feel ! I am just very happy and proud that I was able to share part of the journey with you! On to the summit!!!!!!!!!!!!! Can’t wait for the book!! !!! When we’re in the middle of nowhere, we’re really somewhere special. This journey has helped me appreciate much that I may have overlooked or dismissed in the past. Thanks for sharing part of my journey.